Here is a picture of Jean-Baptiste Riché, President of Haiti. Jean-Baptiste Riché (born 1780) was the Haitian President between March 1, 1846 to February 27, 1847. His military career began in 1802 when he was enlisted in the revolutionary army. He took active part in the war of independence and was hurt by a projectile that damaged the optic nerves of his right eye and went blind. After the downfall of Christophe in 1820, Riché took the side of the new government and retained his post (Commander of Haïti's Northern Province) during the subsequent administrations of Jean Pierre Boyer (President between 1818 to 1843) and his followers and he was able to retain that until Jean-Louis Pierrot became President of Haïti in 1845. These Boyer backers subsequently became his strongest critic. He was the son of a free black man, a sergeant in the colonial militia, who probably served in the rebel forces. 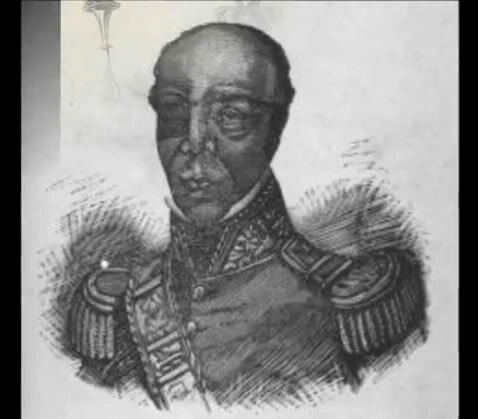 Jean-Baptiste Riché was illiterate and old when became the Haitian President on March 24, 1846. He was succeeded to become the President of Haiti because he had a common sense that ended the dictatorship of his predecessors.